Oh, that horrid coat! 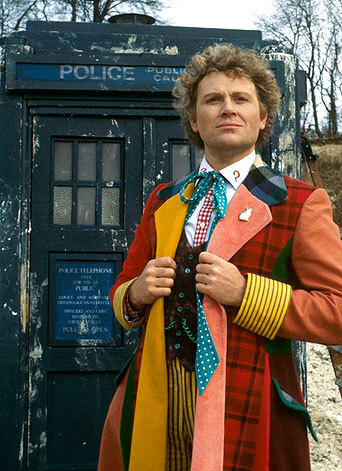 As the apocryphal story goes, the showrunner for Doctor Who, John Nathan-Turner, wanted a really off the wall costume for the Sixth Doctor, and kept sending the costume designer back to the drawing board to come up with something different. Frustrated, the costume designer came up with the most garish thing possible, sure that Nathan-Turner would reject it. Of course, that is the one who chose to pick! As he's stated in interviews, Colin Baker was not a big fan of the outfit either (he was hoping to wear more black, to show the darker side of the character they were going for), although Baker did choose the cat shaped lapel pin, as an indication of the Doctor's current personality (and it was related to some poem about a cat that I don't remember). Seeing this Doctor metaphorically as a cat, to me, is very apropos. The Sixth Doctor is an interesting character, but he kind of puts you off at first. Arrogant, self-absorbed, even cruel at times. In fact, at the very beginning he has the seeds of evil, as in a moment of almost paranoid delusion after his regeneration, the Sixth Doctor attacks his companion Peri. It is with the Sixth Doctor we get the dark side of the First Doctor manifested more fully. This was not the kind, gentle Doctor audiences had become accustomed to with Peter Davison's Fifth Doctor. However, as the Sixth Doctor's tenure continues, we start seeing the Doctor's equally natural compassion and gentleness gaining sway again, perhaps due to the smoothing effect of his companions (as has been related in the show a number of times, it seems that the Doctor's companions are an essential ingredient to helping this alien retain his humanity). Perhaps also it's the Doctor seeing an evil, possibly future version of himself named the Valeyard (who claims to be the Doctor's 13th regeneration), that also makes him realize that if he continues down that path, he may not like who he becomes. Thus, with a mellowing effect that occurs during the Sixth Doctor's adventures, we get the Doctor we have come to love back, although still with a patronizing and sometimes insulting attitude. The Sixth Doctor is anything but a static character, and shows that although the Doctor is still a "good guy," he has his own demons and flaws to wrestle with. There are some top notch stories in the initial season that re-started Doctor Who in 2005, which had been off the air (except for the one off Doctor Who TV movie), since 1989. So this initial fresh start for the Doctor was very welcome in my book. The season finale "The Parting of the Ways" is really dynamite, and we can't forget the phenomenal episodes like "Dalek," "The Empty Child," "The Doctor Dances," and "The Unquiet Dead." Also the Ninth Doctor, I have to admit, is a strong, well-written, and well played character. He has a kind of haunted, angry, PTSD quality about him, which really works with the Doctor coming off, as he has, from the devastating Time War between the Daleks and the Time Lords. Forced to sacrifice both groups, including his own race of Time Lords, to save the rest of the Universe, this Doctor truly went through the crucible. This was a Doctor who had learned to fight war, to make large compromises of questionable morality, even if it was for the supposed greater good. This was a Doctor made out of sacrifice, blood, tragedy and fire, who was in some urgent need of emotional and moral healing. A healing which would come in the form of Rose Tyler, arguably one of the Doctor's most important companions, even though there is intense disagreement between Whovians that love or hate her. I'm personally fond of Rose, although she doesn't rank at the top of the list among my personal favorite among the Doctor's companions (I may have to save that post for another day). And yet with all these great, complex things going for the 9th Doctor, I really have a hard time growing the same attachment to him as I have to other Doctors near the top and middle of my list. Part of it is separating the actor from his character. Christopher Eccleston, I'm sure, is a great guy, but he has shown a sort of indifference to Doctor Who that, as a fan of the show, I find disappointing. Apparently, he had some conflicts with the BBC big wigs and showrunners that soured his relationship with the show, but even with that aside, the fact that he's indicated that he doesn't even watch the show, that he turned down to come back in the multi-Doctor 50th anniversary special, that he seems dismissive of the show in general, kind of gets my dander up. It seems that he only took on the role as a rung in the ladder of his career, and didn't have the same kind of investment in it that, say, David Tennant had (Tennant was a life-long fan of the series, and is very open about his love for the show and how excited he was to play the part). Those kind of detached sentiments from Eccleston don't endear me to him. But even not factoring Eccleston as an actor in, from the get go there was an aspect to the 9th Doctor that put me on edge a bit, despite my enjoyment of that first season of the jump started series. 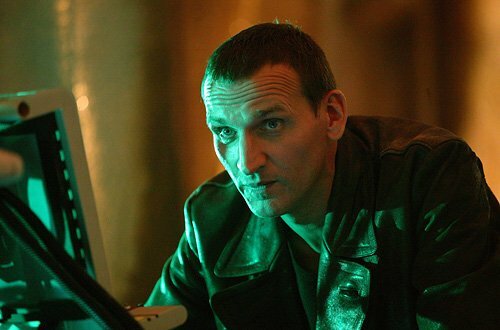 The leather jacket, the bad boy attitude, the snark and the smirk... this wasn't the Doctor I remembered, this wasn't the whimsy and creative spirit that makes Doctor Who such an attractive character to me, despite Eccleston's occasional moments of fun, big eared goofiness. Yet, as you can probably notice, these "darker," more testosterone fueled Doctors all rank lower on my list. I find these Doctors very interesting characters, intriguing even. They keep my attention and still make me want to watch the show to discover the added layers to the Doctor that they reveal. However, as interesting as they are, they don't make me love the Doctor like David Tennant, Matt Smith, or Peter Davison's versions did. They didn't make me care in the same way, and didn't garner the same devotion that truly made me a fan of the show and the character. Fortunately, however, Eccleston's pessimistic Doctor lasted only one season and gave way to a new face, David Tennant's Tenth Doctor, which would usher a whole new day for Doctor Who, and really capture the hearts and minds of millions of fans. And Tennant's bright day in the sun was made all the more brilliant for the contrast that Eccleston's brooding, dark, complex 9th Doctor brought. Okay now we are at the bottom of the list, and I don't mean to slight Jon Pertwee for putting him down here. As I said at the beginning of this series, I'm fond of ALL the Doctors, and have reason to admire each of their interpretations of the character. And, as a person, it seems from what I've read and heard, that Pertwee was an absolutely lovely human being, which came across in the character as he seemed to have a bedrock of decency that he brought to the role, especially when the Doctor interacted with fellow U.N.I.T. members and companions, who he sincerely seemed to have an attachment for. Yet, for precisely the same reason that I have a hard time really getting into James Bond (although, from what I've heard of the Daniel Craig version of that character, I might give him another try), I also have a harder time really getting into the Third Doctor. With the Third Doctor's regeneration, we get a Doctor who is more of an action hero than the brainy, clever, compassionate Doctor that most modern Whovians would recognize. 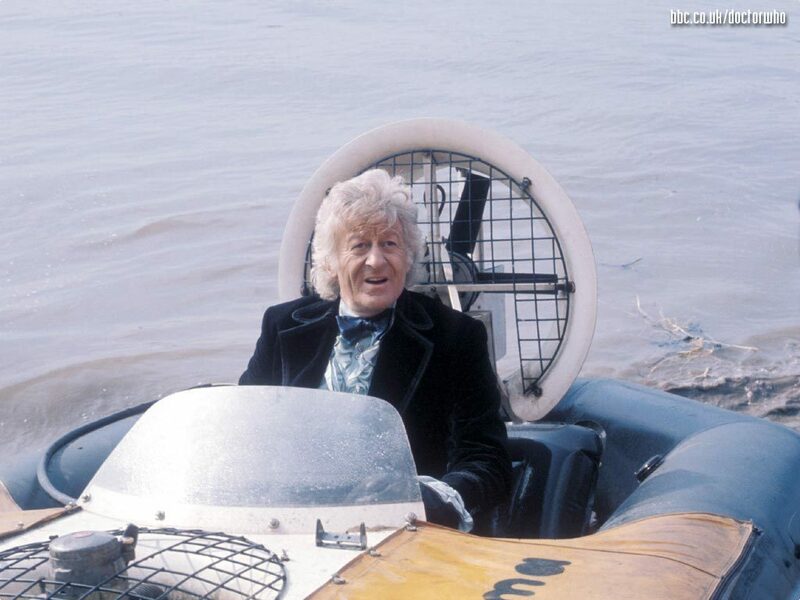 The Third Doctor was much more prone to cars, helicopters, and a military environment than preceding or succeeding Doctors, and was more likely to win a battle with a karate chop than with his brain, as we are now prone to expect. Instead of the thinking man's hero, as Doctor Who has become, the Third Doctor made himself all the more generic by turning up the testosterone and turning down the brain (not that this Doctor was portrayed as any less brilliant than the others, he just used those skills for more action oriented solutions). However, the Third Doctor gave added many important characters to the mix, which are memorable even to modern Whovians, including Sarah-Jane Smith, the Brigadier, the Autons, and notably the Master. The Doctor's arch-enemies conflict/bromance with the Master began with the Third Doctor, and seeded the ground for a fruitful through line in the long game of the series. And, apparently, Pertwee and the first actor who played the Master, Roger Delgado, were very close friends and it was ultimately Delgado's real life death that put Pertwee to the sinking of spirits that was part of the series of events that led to Pertwee retiring his coat as the Doctor. I find that back story to be incredibly poignant. And it appears that Pertwee had great affection for his character and the show that endears him to me on a personal level, even when I don't always relate to his Doctor on a story level. And May the Doctors Regenerate Forever! So with Peter Capaldi stepping into a future regeneration of the Doctor at Christmas time, and with John Hurt playing a (from what I've heard) past, secret regeneration of the Doctor in the 50th anniversary special, we will have two new Doctors to assimilate into lists like these, but I hardly think that will be the end of the long, prestigious list of Doctors. May the popularity that the show is enjoying right now only increase, and may the tradition of the Doctor live long in the history of television and other mediums. Alons-y!